The Corsair Obsidian 550D, the case recommended for the High-End Workstations, thanks to its looks, sound dampening, cooling performance and ease of components installation. 1. Every single part is hand-picked to ensure top-notch reliability and performance. 2. We don’t cut corners by using a no-brand low-quality power supply, cheap sleeve fans or any other parts that are likely to fail early. 3. Designed to run cool and relatively quietly. 4. For the same price, you’ll get more performance out of your custom workstation, or you’ll save money while getting the same performance compared to a retail PC. 5. Longer warranties on individual parts vs a shorter warranty on the whole PC. Parts have 1 to 6 years or even lifetime warranties. 6. No time wasted on uninstalling pre-installed bloatware and useless programs that you didn’t want in the first place. Build your own custom workstation today. It’s easier than you think! This Build includes all the parts/cables that you need and it was double-checked to ensure compatibility. Simply order your parts, set aside some time (a few hours at most), grab a screwdriver, get a table with a lot of light and build the workstation. Much higher CPU performance thanks to the two physical CPUs with up to 16 cores in total. The possibility of adding more RAM, up to 128GB, thanks to more RAM slots. We offer four different tiers (configurations) in this article, to match different workload requirements. Go right below this section to see our recommendations depending on which program you use. Tier A: High-End Workstation, with support for up to 4 or 8 monitors. Tier A is the basic high-end Workstation, equipped with dual CPUs and one or two video cards to handle up to 4 or 8 monitors at once. This Tier is ideal if all you need is a lot of CPU processing power, with support for multiple monitors. Tier B: For 3D modeling, CAD and the like. Tier B is equipped with a Nvidia Quadro K5000, in order to handle your 3D, CAD and the like. Supports up to 4 monitors. If you need strong computing performance for GPU Computing applications (e.g. Seismic processing, CFD, CAE, Financial computing, Computational chemistry and Physics, Data analytics, Satellite imaging, Weather modeling, etc. ), Tier C is the way to go. It supports Nvidia 2nd generation “Maximus” technology, where you combine two video cards: A Quadro card for graphic (display) purposes and a Tesla K20 5 GB GPU Computing Accelerator card for computing (rendering) purposes. By sharing the loads on two specialized cards, you get better computing performance than using only a Quadro card with your CPU(s). Tier D is equipped with dual CPUs, one video card that supports up to four displays and a pro sound card, the ESI [email protected] XTE. Which Tier do you need for your applications? Based on your comments and requests from the Workstation Builds: Throw in your Requests and Suggestions! post, I’ve come up with a list of recommendations, based on programs and their requirements. Adobe Applications: Creative Suite 5 Master Collection, Photoshop, Premiere Pro, After Effects, Lightroom, Illustator, Indesign, Bridge, Bibble, Flash, Dreamweaver, etc. : Tier A. If you have intensive work that brings a modern (Quad-Core and higher) PC that its knees, consider faster CPUs. The faster that your CPUs are, the faster that the rendering/work will complete. Upgrading to more RAM (64GB) would be a good idea if you work with many very large files. AutoDesk Suite (AutoCAD, Inventor, Revit, etc. ): Tier B. If your CAD workflow involves a lot of heavy rendering, computing and/or simulation, go with Tier C for higher performance. CAD: Tier B. If your CAD workflow involves a lot of heavy rendering, computing and/or simulation, go with Tier C for higher performance. Cinema 4D: Tier A, Tier B for higher-performance. While it will run just fine with the High-End Workstation as it is, this is an application which scales very well when you add performance to your PC, meaning that the better that are your parts, the faster that your renderings will be completed. A faster Quadro card will improve performance and so will faster CPUs, especially the 8-core variants. Nvidia CUDA: Tier B or if you want even higher performance, Tier C.
Sage 300 Construction and Real Estate (formerly Sage Timberline Office): Tier A. Go with Windows 7 Professional or Ultimate; Home Premium isn’t supported. Other Programs: Got another program that you’d like to know if it would run well on the High-End Workstation or would require upgrades? Leave a comment at the end of this article and I’ll get back to you with my recommendations. Need a Tier recommendation for your specific workload? Simply leave a comment at the end of the article. Note that if you want me to recommend to you a completely custom workstation which is different from the four Tiers outlined in this article, I offer consulting services as well. Simply scroll down to the Consulting section towards the end of the article for more information. 1. Recommended Components are in Bold. 2. Suggested Alternatives and Upgrades are in Italic. 3. Some parts can be upgraded on any Tier and some parts can only be upgraded on some Tiers. See the indications below. – Tier B: For 3D modeling, CAD and the like. Click on a component’s name (e.g. CPU) to jump to the detailed section of it. All Tiers: 32GB: Two Kingston 16GB (4x4GB) DDR3 1600MHz 1.5v ECC Reg. 64GB: Two Kingston 32GB (4x8GB) DDR3 1600MHz 1.5v ECC Reg. SSDs: Use the motherboard SATA ports. Can be upgraded on any Tier. Hard Drives: You’ll need a RAID card or a NAS for RAID 6. Upgradable on any Tier. Tier A and D: Seasonic X-850 850W 80 PLUS Gold Modular 5yrs war. Tier B: Seasonic X-1050 1050W 80 PLUS Gold Modular 5yrs war. Tier C: Seasonic X-1250 1250W 80 PLUS Gold Modular 5yrs war. Cooling: See full section for where and in which direction to install the case fans. Trying to reduce the price of your Workstation? 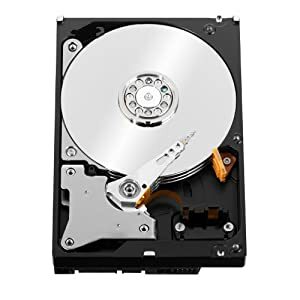 Remove both SSDs (-$500) and only use the hard drives. Sure, the OS, programs and files won’t load as fast, but this won’t affect the processing/rendering speed much, if at all. Go from two SSDs in RAID 1 to a single SSD (-$250), where you lose both performance and redundancy. Buy only one CPU and 16GB of RAM (4x4GB, just get a single kit) instead of two CPUs and 32GB (8 x 4GB) of RAM, to save $800. Needless to say, this involves a massive performance hit. Not recommended unless you intend on adding the second cpu/set of RAM later on, otherwise the Mainstream Workstation will offer more performance at an even lower price point. Who are you to tell me which parts to choose? Can you suggest me a step by step guide to build a computer? Have questions, need to consult with an expert? I offer consulting services if you require my help. Simply scroll down toward the end of the article, to the consulting section, for more information. What makes this motherboard great is the fact that it features two LGA 2011 sockets, allowing for a Dual-CPU setup, on the practical ATX format, allowing you to use a regular power supply and case, instead of far more expensive server parts based on far less common standards. 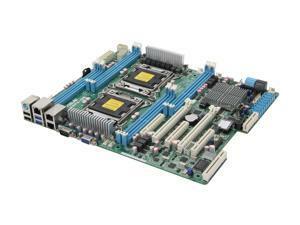 – It supports two Xeon 26xx series CPUs with a TDP of up to 135W for each CPU. – It supports up to eight RAM sticks, with a frequency up to 1600MHz (depending on the CPU, see the CPU section for more info). I recommend filling them all, in order to get as much bandwidth as possible by taking advantage of quad-channel RAM (quad-channel: 4 RAM slots per CPU x 2 CPUs). During installation, do note that you need to plug in a 24-pin power cables and TWO 8-pin power cables in order for the motherboard to function properly. Rest assured that the recommended power supplies do come with those power cables. On the back, you have two USB 3.0 ports, two USB 2.0 ports, one PS/2, a serial port, a VGA output and three LAN ports (Two Intel 82574L 10/100/1000 Mbps LAN ports and one mgmt LAN port). Two PCI-Express 3.0 16X, three PCI-Express 8X slots, one PIKE slot (Used for Audio Card), two SATA 6Gbps and four SATA 3Gbps ports. Note that the board does not support floppy drives nor IDE-based drives. Tier A (dual video cards): Top PCI-Express 8x slot: Sound card, top PCI-Express 16x slot: 1st video Card, bottom PCI-Express 16x slot: 2nd video card. No RAID card, make sure to get a NAS for the hard drives in RAID 6 (see storage section). Tier C: Top PCI-Express 8x slot: Sound card, top PCI-Express 16x slot: Quadro K5000, bottom PCI-Express 16x slot: Tesla card. No RAID card, make sure to get a NAS for the hard drives in RAID 6 (see storage section). Note that the motherboard includes six SATA cables, so you don’t need to buy any additional SATA cable, unless you add a lot more drives, since the build only needs three cables (two SSDs and one optical drive, the hard drives have cables with the RAID card or don’t need any in the NAS). Note that the price is for two (2) CPUs. The Xeon E2630 is the second lowest-end entry-level Xeon CPU from the E26xx family. It features six cores + Hyper-Threading, so it can handle up to 12 threads. Its base frequency is 2.3GHz but just like the consumer class Core i5 and i7 CPUs from Intel, it can automatically and safely boost its frequency, up to 2.8GHz for the E-2630, when faced with heavy workloads. Did I say entry-level? That’s relative, considering that this setup will outperform any comparatively priced system. Needless to say, for your workloads, this setup will outperform any single cpu setup, whether it’s from AMD or Intel, in the vast majority of workstation type of workloads. If you need raw CPU power, a dual-CPU setup is a great upgrade from a single-CPU setup. The dual-socket 2011 platform gives you access to Quad-Channel RAM and also allows you to upgrade to the 8-core Xeon CPUs (See the available upgrades below) if you want even more performance. Note that no CPU Cooler is included with them, hence why I recommend a CPU cooler further down in this article. Note that the maximum RAM frequency supported by the E-2630 is 1333MHz. If you want 1600MHz RAM support, you’ll need to upgrade to the E-2650 or an higher-end model. Higher RAM frequency means more memory bandwidth, which can improve performance with some programs. Note that core count and frequencies are compared to the E5-2630. – Two Intel Xeon E5-2640 2.5-3.0GHz Turbo Six-Core + HT 95W – Base and Turbo frequency higher by 200Mhz, identical otherwise. RAM will run at 1333Mhz. – Two Intel Xeon E5-2650 2.0-2.8GHz Turbo Eight-Core + HT 95W – Two additional cores (8 vs 6 cores), base frequency lower by 300Mhz, Turbo frequency identical. RAM will run at 1600Mhz. Two Intel Xeon E5-2660 2.2-3.0GHz Turbo Eight-Core + HT 95W – Two additional cores (8 vs 6 cores), base frequency lower by 100Mhz, Turbo frequency higher by 200MHz. RAM will run at 1600Mhz. Two Intel Xeon E5-2665 2.4-3.1GHz Turbo Eight-Core + HT 115W – Two additional cores (8 vs 6 cores), base frequency higher by 100Mhz, Turbo higher by 300MHz. RAM will run at 1600Mhz. Two Intel Xeon E5-2670 2.6-3.3GHz Turbo Eight-Core + HT 115W – Two additional cores (8 vs 6 cores), base frequency higher by 300Mhz, Turbo higher by 500MHz. RAM will run at 1600Mhz. Two Intel Xeon E5-2680 2.7-3.5GHz Turbo Eight-Core + HT 130W – Two additional cores (8 vs 6 cores), base frequency higher by 400Mhz, Turbo higher by 700MHz. RAM will run at 1600Mhz. Two Intel Xeon E5-2690 2.9-3.8GHz Turbo Eight-Core + HT 130W – Two additional cores (8 vs 6 cores), base frequency higher by 600Mhz, Turbo higher by 1000MHz (1GHz). RAM will run at 1600Mhz. This is the fastest Xeon CPU available that’s compatible with this build. While the motherboard comes with a VGA output, I recommend avoiding using it, as its based on the awful Aspeed AST2050 onboard video chipset with a mere 16MB of memory, which is completely underwhelming and useless for a Workstation. 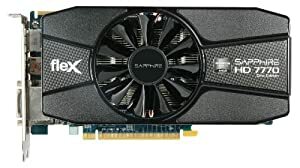 The video card that I recommend for Tier A and D, the Sapphire Radeon HD 7700 1GB Flex may look like a rather basic video card, but it has the capability of outputting to up to three DVI monitors without any adapters. This is unique to Sapphire Flex video cards, other Radeon video cards support two video cards out of the box or three with an adapter. For more information on Sapphire FleX technology, I invite you to visit this page on their website. Need support for more than 4 monitors? If you need support for more than 4 monitors, you can add a second Sapphire Radeon HD 7770 Flex to your system, without any other modification to the workstation. Out of the box, you’ll have support for 6 displays. By adding one or two adapters recommended above, you’ll get support for 7 or 8 displays respectively. – This option is only compatible with Tier A, as the other Tiers have other video or sound cards that will prevent you from installing two Sapphire Radeon HD 7770 Flex in your system. – If you use two Sapphire Radeon HD 7770 Flex, you will be unable to install a RAID controller card. To be able to have four hard drives in RAID 6, you’ll have to purchase a NAS (Network Attached Storage). I recommend the – Qnap TS-469-PRO-US for its high performance (Dual-core CPU, 1GB RAM, Dual LAN ports), reliability, solid build and top-notch customer support. It will store the four hard drives, will allow you to run them in a RAID 6 array and connects directly to your workstation via two LAN ports. Alternatively, you can connect it to your network, so that other users can easily access it. Recently launched, the Nvidia Quadro K5000 4GB is the most powerful professional card from the Nvidia Quadro line-up. It will easily take care of 3D rendering, CAD programs and the like, as well as accelerating programs UI and video decoding of course. It is capable of handling four monitors, with DVI-I DL + DVI-D DL + DP 1.2 + DP 1.2 display connectors. Performance wise, the latest Quadro line-up (K series, avoid the older non-K series) has the edge over the FirePro series, thanks to superior drivers that simply deliver more performance. Quadro cards are also supported by more applications and finally, their drivers are more optimized for greater performance in some applications. Considering the cost of this workstation, I’m sure that you’ll want to get top-notch performance all over the place in all apps, including Adobe apps and top-notch drivers, hence why I only recommend Nvidia Quadro cards in this build. “Exact pinpoint renders for things such as vehicle/building/contraption etc design, think many moving parts working together such as an engine prototype….things where a millimeter or so off could mean hundreds of thousands of dollars or much much more lost or even death…. They are tools for professionals, and if you really need one you’ll know it. Gaming cards and workstation cards are very similar, but the differences are major. Consumer cards are built for speed at the cost of accuracy, gaming renders need to be fast…not perfect. Workstation cards are the opposite, they need to be perfectly accurate at all times, speeds good but not priority, major differences in the cards are ECC ram (expensive, but a lost bit could be catastrophic) and very robust and detailed driver support…the drivers are really where the bulk of the expense comes from and , they have to work and have to work well, we gripe and moan about bugs in our games…when the card is holding you back from your livelihood…. It cost money to make money and or move things forward to a large degree, great designs aren’t doodled out on a napkin in a country diner anymore. There are many products out that scale the same way, look at cameras, a $200 point and shoot for the trip to disney world or the $5000+++ used to shoot what we see in magazines and such, a nice solid sub $500 Asian import guitar vs a $3K+ made in the USA model, the latter has better quality components and much more time and care in construction. If you need strong computing performance for GPU Computing applications (e.g. Seismic processing, CFD, CAE, Financial computing, Computational chemistry and Physics, Data analytics, Satellite imaging, Weather modeling, etc. ), Nvidia offers their 2nd generation “Maximus” technology, where you combine two video cards: A Quadro card for graphic (display) purposes and a NVIDIA Tesla K20 5 GB GPU Computing Accelerator card for computing (rendering) purposes. By sharing the loads on two specialized cards, you get better computing performance than using only a Quadro card with your CPU(s). For more information on Nvidia’s Maximus technology, performance improvements that you can expect and testimonials, visit this page. If your computing needs aren’t that demanding yet, you can stick to only a Quadro card and upgrade to the highest-end Quadro (K5000) if necessary. If you have a Quadro K5000 already and need more computing power or if you just know that you need as much computing power, then adding a NVIDIA Tesla K20 5 GB GPU Computing Accelerator computing card to your workstation that also contains a Quadro K5000 makes sense. Note that the Tesla card has no display outputs, so you must have a Quadro card to handle your monitors. As explained above, combining it with a Quadro K5000 is the best and most powerful option, hence why that’s what I’m recommending for Tier C.
The downside of using a Tesla K20 card with a Quadro K5000 card is that due to the dual-slot size of both cards, you will be unable to install a RAID controller add-on card, due to the lack of space on the motherboard to do so. In other words, you can still have two SSDs in RAID 1 with the Tesla K20 card and the Quadro K5000 card, but four hard drives in RAID 6 (which requires an add-on RAID controller card) won’t be possible, unless you get a NAS (Network Attached Storage), which is an external enclosure that can be connected directly to LAN port(s) to ensure high transfer rates, with four hard drives in RAID 6, along with two SSDs in RAID 1 in the PC case. I recommend the $815- Qnap TS-469-PRO-US for its high performance (Dual-core CPU, 1GB RAM, Dual LAN ports), reliability, solid build and top-notch customer support. It will store the four hard drives, will allow you to run them in a RAID 6 array and connects directly to your workstation via two LAN ports. Alternatively, you can connect it to your network, so that other users can easily access it. Note that you need to buy two (2) of those kits, so that you get a total of eight (8) RAM sticks, to fully populate the motherboard’s RAM slots, in order to take advantage of quad-channel and get as much RAM bandwidth as possible. 32GB of memory: Run lots of programs with many large files with no problem! 32GB of RAM will allow you to run many programs at once, with a lot of larges files open at the same time, with minimum latency. I recommend Kingston for their high reliability (lowest return rate in the RAM industry, according to hardware.fr who gets their data from a major e-tailer) and compatibility with the vast majority of motherboards. “(…) can detect and correct the more common kinds of internal data corruption. ECC memory is used in most computers where data corruption cannot be tolerated under any circumstances, such as for scientific or financial computing. ECC memory may be more expensive than standard memory, but it’s also a lot more reliable and a lot less prone to failure, two highly important factors for a Workstation. Alternatives: Need more than 32GB? 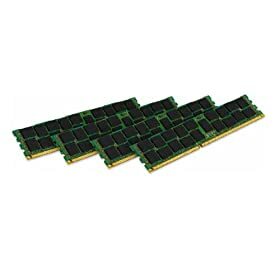 If you need more than 32GB for your specific needs or just want to future-proof your workstation with more RAM, here’s a 32GB (x2 = 64GB) and 64GB (x2 = 128GB) kit. Remember that you need to buy two kits, so that you get a total of eight (8) RAM sticks, to fully populate the motherboard’s RAM slots, in order to take advantage of quad-channel and get as much RAM bandwidth as possible. For the High-End Workstations, I’m recommending two Samsung 840 Pro SSDs in RAID 1 and four Western Digital Red hard drives in a RAID 6 array. 1. The SSDs will give very high performance for the OS, demanding programs and large files that you are currently working on, while the hard drives will provide a lot of storage space to save your projects and other large files for backup. 2. By backing up your SSD content onto the hard drives, you ensure that you have two redundant storage solutions, so if against all odds you get a critical failure on your SSDs, you still have your data safe on the hard drives, which are setup with RAID 6, which allows for two drive failure, so if you lose one hard drive and when you re-construct the array you lose another (more common than you think, especially with large 1+TB hard drives), you will not lose any data, unlike with RAID 5. In other words, even if you lose both SSDs AND two hard drives, your data is still available. – One of the two SSDs in RAID 1 fails: The other SSD still contains all the data from the failed SSD. Simply replace the failed SSD and rebuild the RAID 1 to ensure data availability on both SSDs. No data loss. – Both SSDs fail: Replace both SSDs and load a saved image of their content from the hard drives. No data loss. – One hard drive fail: Replace the failed hard drive and rebuild the RAID 6 array. No data loss. – One hard drive fail and a second hard drive fail during the RAID array rebuild: Replace the faulty hard drive and rebuild RAID 6 array. No data loss. – Both SSDs fail and two hard drives fail: My, what are the odds of that? Still, replace the faulty hard drive, rebuild RAID 6 array. Then you replace both SSDs and load a saved image of their content from the hard drives. No data loss. As you can see, this is a solid solution that ensures that your data is safe. However, if you have a 3 or 4 hard drives failure, you WILL lose your data, so to be certain, backups over other locations (external hard drive, other NAS, online server, optical disks, USB key, etc. ), preferably off-site (to avoid data loss in the case of fire or theft) are recommended to be absolutely confident that you will not lose critical data even in the worse case possible. RAID is not a backup solution, all it means is that if a drive fails, the data is available on another drive. However, it doesn’t protect you from an accidental file deletion, viruses, problems with software or OS updates causing issues and the like. RAID is not going to help you with any of those problems, because all drives will have the same problems. Taking the time to setup a proper backup system is critical to avoid headaches that will cost you precious time and money later. That said, let’s move on to the recommendations. To run RAID 6 on your four hard drives, you’ll want a RAID controller card. I recommend the $370 – ARC-1213-4I-MS PCI-E 4x drives SATA RAID Controller Card – Extra Text. Since you can’t install a RAID controller card due to the lack of space caused by the two video cards, you’ll want a NAS. I recommend the Qnap TS-469-PRO-US for its high performance (Dual-core CPU, 1GB RAM, Dual LAN ports), reliability, solid build and top-notch customer support. It will store the four hard drives, will allow you to run them in a RAID 6 array and connects directly to your workstation via two LAN ports. Alternatively, you can connect it to your network, so that other users can easily access it. 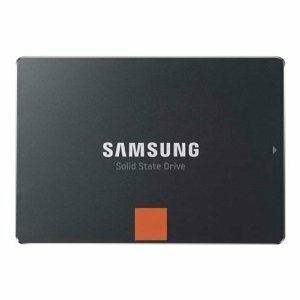 Why the Samsung 840 Pro (not to be confused with the 840 non-Pro series) SSDs? 1. Reliability: From my research and customers feedback, Samsung produce the most reliable SSDs right now, hence why I recommend them for a Workstation. 2. Performance: The Samsung 840 Pro tops the charts, pretty much all professional reviewers online praise its high performance, even under very demanding workloads. Samsung 840 Pro SSDs have a SMART attribute “Wear_Leveling_Count” which counts down from 100 to 0 as the drives wear out. This allows you to track their usage and to predict when you’ll need to replace one of them if necessary when the time comes. Note that this is likely to take many many years. Thanks to RAID 1, if one of them fails, the other one still holds your data. The case natively supports 2.5″ and 3.5″ drives, so you don’t need any adapter. The motherboard includes six SATA cables, so you don’t need to buy any additional SATA cable, since the build features two SSD and one optical drive, for a total of three SATA drives. The hard drives are connected to the RAID controller card (which has a dedicated cable to handle the four SATA hard drives) or a NAS, which doesn’t require any cables. In other words, you shouldn’t need any additional SATA cables. Need more than 256GB of ultra-high-speed storage? Why the Western Digital Red series? 1. They are designed for 24/7 usage. 2. They are designed for RAID environments, no dropout after a short amount of time. 3. Three years warranty with 24/7 support. Simply put, they offer great reliability, can be used in RAID, in a NAS, are designed designed for 24/7 usage and offer a great warranty. Ideal for a workstation. 2TB isn’t enough for you? This drive is able to read and burn CDs and DVDs. Relatively silent (it obviously makes some noise when reading/burning at high speed), compatible with all major formats including DVD-RAM. 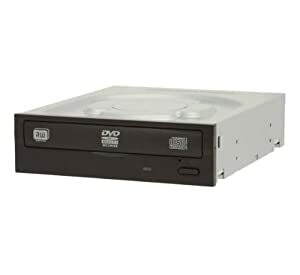 If you want the ability to read and burn Blu-Ray disks, then the Pioneer Black 15X SATA Blu-Ray/CD/DVD Burner is what you want. As far as I know, you still require a specific software to playback Blu-Ray disks on a PC. Based on various reviews and feedback on various forums, PowerDVD 12 3D Ultra is the software that I recommend to you. You’ll want at least the professional version for Blu-ray playback. It is fully compatible with Windows 7/8 and shouldn’t give you any problems. A powerful workstation needs a case to match it. It needs to be capable of ensuring proper cooling, while being discrete enough to not get some odd stares (Lots of noise is annoying and flashy LEDs look out of place in a corporate environment). With a subtle yet good looking style design including a diamond-cut brushed aluminum front panel, sound proofing and an ease of components installation that their rivals could learn from, the Corsair 550D is what I recommend to you. Cooling wise, this case includes three case fans but unfortunately, they have sleeve bearing, which tend to fail within a year and can be noisy.To ensure proper cooling with enough airflow, low noise and many years of service, you’ll be replacing them. See the cooling section for more details. A solid case. No flimsy panel, nor sharp edges here. A case that facilitates your PC assembly. Working in this case to assemble your PC is a lot easy and simpler than in some other cases. A tool-less system that works. Support for up to six 2.5″ and 3.5″ drives, perfect for two SSDs and four hard drives. 2 x USB 3.0 and Audio out/MIC in at the top. Unfortunately, USB 3.0 aren’t supported by the motherboard, but the case includes a converter to USB 2.0, which is supported by the motherboard. So you’ll effectively have two USB 2.0 ports on the front of the case. Rest assured that you also have two USB 3.0 and two more USB 2.0 ports on the back of the motherboard. 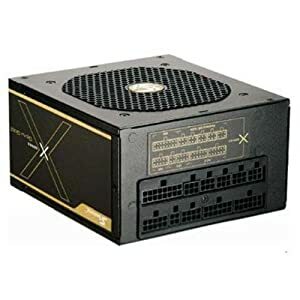 Seasonic X-850 850W 80 PLUS Gold Modular 5yrs war. This power supply has a maximum power output of 850W, not that should rely only on this information as I often point in posts such as Warning: 6 Surefire Ways of Blowing Up Your Computer Due to an Inadequate Power Supply. More importantly, it can output a maximum of 70A on the 12V line, one of the most important factors when it comes to choosing a power supply. Best of all, it is 80 PLUS Gold certified, meaning that it’s always at least 85% efficient, resulting in less heat, more silence and a lower electricity bill for you, compared to a less efficient power supply. Also good to know: It’s modular, meaning that you only plug in the power cables that you need, instead of being stuck with a bunch of unused cables that you have to tuck away somewhere in your case. The Seasonic X series is known for the very high quality of its components and its reliability. That and the fact that features two EPS 12V 8 pins connector, a must for the dual-CPU motherboard that requires two EPS 12V connectors. Many power supplies only offer one EPS 12V connector and would be inadequate for this workstation. Finally, it comes with a solid 5 years warranty. With its Quadro K5000, Tier B requires a more powerful power supply. I recommend the Seasonic X-1050 1050W 80 PLUS Gold Modular 5yrs war . With the Quadro K5000 and the Tesla card, you’ll need an even more powerful power supply. The Seasonic X-1250 1250W 80 PLUS Gold Modular 5yrs war is what I recommend. I highly recommend getting a UPS, especially if you’re in an area with a lot of thunderstorms, brownouts or in a work area with older electric wiring. If you lose power, the UPS will keep your PC running for a few minutes, enough for you to save your work and to properly shutdown your PC. The two recommended UPS below also protects against electrical surges, protecting your PC and other equipment plugged into the UPS, from dangerous power surges, which are one of the main causes of defective computers. PC components are extremely fragile and the last thing that you want is to plug all that expensive equipment equipped straight in a power outlet. You want it plugged in a surge protector (featured in the UPS units below), which will protect your expensive equipment. 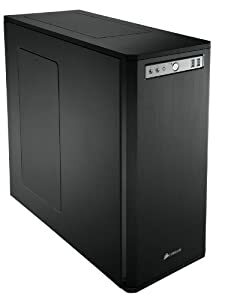 The Cyberpower PP1500SW-T2 UPS 1000W PureSine 7-Outlet is my recommendation for Tier A and D. Keep in mind that the UPS also has to power your monitor and anything else plugged in it, hence the overhead here. For Tier B and C, you’ll want the Cyberpower PP2200SW UPS 1500W PureSine 8-Outlet instead. Note that it requires a NEMA 5-20R receptacle, or in other words, a different power outlet. If you have no such outlet, you can simply use this Conntek 1-Foot 15-Amp to 20-Amp NEMA 5-15P to 5-15/20R Power Adapter Cord and use a standard 15A power outlet for your UPS. Yes, there are less expensive UPS units available, but nothing that’s as reliable as the units above. These are designed for network-grade, mission-critical servers and other environments where a power loss without a chance to save current projects would be disastrous and unacceptable. The recommended UPS units above are made solid, batteries are replaceable and the UPS units work when they need to. This Workstation is based on a server-type platform, meaning that the CPUs don’t include CPU Coolers. Also, since this is a dual-socket motherboard, you have to be careful to pick a heatsink that will both fit and that will be capable of offering proper cooling, in order to ensure reliability, even when you run your workstation under a 24/7 load. 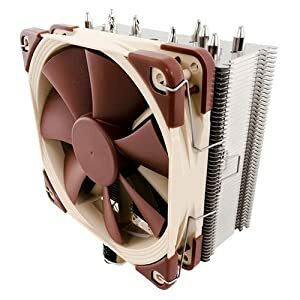 The Noctua NH-U12S will do exactly that and after a lot of research, it is my recommendation. Equipped with the Noctua NF-F12 fan which features a high-quality SSO bearing, you can be sure that it will last many many years while being fairly silent. Rest assured that if for any reason you wish to change the fan, it’s something possible with this CPU Cooler. To top it off? Noctua offers a six years warranty! The customer service is top-notch and the long warranty is a statement to the quality of this product. Remember though: You’ll need to buy two, since you have two physical CPUs in this system. The thermal compound is what you’ll put between the CPU and the CPU Cooler, and its job is to transfer heat between the two. Using an high-quality thermal compound ensure that your CPU temperatures will be as low as possible. The great news is that the Noctua NH-U12S includes some NT-H1 thermal compound. It’s a top-notch product that I have no problem recommending. To ensure proper cooling, low noise and longevity, you’ll be replacing the case stock fans with the following Noctua fans. Exceptional quality, with SSO bearings that are reliable and will last many many years (MTBF rating of more than 150.000 hours, or over 17 years running 24/7) without making more noise, clicking or anything that you’d expect from an aged fan. Good airflow to noise ratio: They provide good airflow while being next to silent. A few fans from other companies offer slightly better performance, but none are as reliable as the Noctua fans. Seeing as the motherboard has no onboard sound, I recommend a basic 5.1 sound card. Because it’s so small, it will fit in the top PCI-Express 8x slot, next to the RAM slots, allowing you to install two video cards or one video card and a RAID card. Of course, for a digital audio workstation, a basic 5.1 sound card won’t cut it. For Tier D, I recommend the $290 – ESI [email protected] XTE PCI-E 1x. If you want one of the best, if not THE best professional sound card available, this is it. It features highest quality 24-bit 192Khz ADC (114dB) and DAC (112dB). Its unique swappable I/O socket allows you to choose your analog connectors between unbalanced RCA jacks and balanced TRS jacks, making [email protected] XTe the perfect solution for any stereo I/O application, analog and digital. The EWDM drivers of [email protected] XTe provide unparalleled performance and stability, and provide support for all professional audio applications using ASIO. Of course, Windows 7 and 8 are supported. With its digital I/O and the integrated MIDI interface, [email protected] XTe is perfect for post-production studios, one man bands and use with mixers and you can monitor the inputs and outputs directly through the digital mixer. [email protected] XTe features optical and digital outputs that allow AC3/DTS pass through for Dolby digital and DTS surround sound playback. 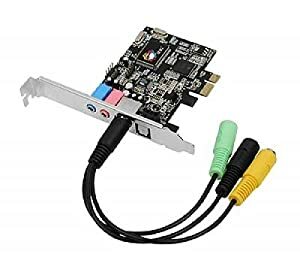 Of course, if you already have your own PCI-Express sound card and would rather use it, it should work without any issue in this workstation. Note that PCI sound cards are NOT compatible with this build, because the motherboard has no PCI slots. Integrated on the motherboard are three Gigabit LAN connectors. – Inexpensive and reliable – Rosewill RNX-N180UBE Wireless USB 2.0 802.11b/g/n with 5 dBi Antenna , which connects into a USB 2.0 port. It comes with a base, so that you can move it away from the PC for better reception and a 5dBi external antenna to improve reception further. Support 802.11b/g/n, 300Mbps max. – Supports up to 900Mbps- ASUS Dual-Band Wireless-N900 USB-N66 , which connects into a USB 2.0 port. The receiver is a base, so that you can move it in the best spot for better reception. Support 802.11b/g/n. Dual-band 3×3, up to 900Mbps. You may be able re-use a previous license, have a corporate license (volume license), etc.. Despite Linux gaining more and more support, Windows still is the platform of choice for compatibility at the moment. Considering that you’ll have 4GB of RAM or more, along with a dedicated video that also has memory (512MB or 1GB), you’ll need a 64-bit version, as 32-bit is limited to 4GB of memory for the entire system, which is not enough now, nor in the future if you decide to upgrade. Windows 7 Home Premium: To avoid, as it supports a maximum of 16GB of RAM, while the High-End Workstations are equipped with at least 32GB. Windows 7 Pro and Ultimate support up to 192GB of RAM. Released on October 26th 2012, Windows 8 is Microsoft’s latest version of the popular Windows operating system. While it uses the same core as Windows Vista and Windows 7, visually it is a departure from these two OS, using colourful tiles and a look often referred to as “Metro”. While you can switch back to the classic desktop look, “Metro” loads up by default. The “Start” button and menu are gone too. While this will irratate some users, it is possible to have the desktop load by default and it is also possible to bring back the start button and menu by installing third parties apps. The vast majority of applications that ran on Windows Vista and 7 should have no problem running on Windows 8. For more information on Windows 8, there are countless reviews of it available online that will do a better job than I can fully describing the changes that it brings to the Windows OS. Should you use Windows 7 or 8 for your workstation PC? More importantly, Windows 8 is a brand new OS, while Windows 7 has been around for three years. What this means is that Windows 7 bugs have been nearly all fixed, while Windows 8 is crippled with bugs, as any new operating system usually is. Considering these two points, I’d sticking with Windows 7 for now. Don’t get me wrong though, Windows 8 definitely brings some good changes to Windows and it has the potential of being a great OS eventually, but it still needs some time to get its bugs fixed to be reliable enough for a workstation laptop. Perhaps when its first service pack (SP) or the rumored Windows “Blue” will be released, Windows 8 will be the OS of choice. To find out more about Windows 8, I invite you to read one of many reviews available online that get deep into what has changed from Windows 7 to WIndows 8. I’m a computer expert with over 12 years of experience in recommending, building, fixing and modifying computers. I’ve assisted countless people and companies over the years with completely custom designs ranging from $300 to $25,000+ and of course, I’ve assembled many systems myself. In the last two years, I’ve recommended for over 10 millions dollars in various computer equipment purchases. I’m not your average Joe, nor your Mom & Pop’s consultant. People trust me because I’m independent, neutral, stay on top of new technologies and because I recommend only what I would buy myself. The computer looks amazing. Exactly what I was looking for. Thank you very much for your help. Thanks for all your help! The computer is a beast! You were a great help as I do not have the knowledge base concerning individual components and compatibility. (…) matching the individual pieces to produce a level performance field was key. I could not be more happy with the system! I’ve known Mathieu for some time now and while his knowledge of computer hardware has continued to astound me, I’ve been even more impressed with his personable, affable nature! (…) if I were you, I’d hire him without hesitation! Configuration verification for compatibility, what’s best for your needs, etc. – Are you hesitating on what’s best for your needs? – You want to have your final build double-checked and get my opinion on it before ordering? My rate for basic services consulting is $99.95. – My recommendation on what’s best for your needs. – My confirmation that your workstation parts are indeed compatible and are the best choice for your budget or alternatively, will tell you that this is not the case and offer you alternatives that are compatible, reliable and offer the best performance at a given price. I accept Paypal only, which allows for credit card payments or electronic transfer from your bank account. Once your payment is completed, please contact me with your questions at the e-mail found further down in this article. Custom build for your specific workload needs. Basically any modification to a Workstation that requires a part that isn’t recommended/suggested in this article is considered advanced services. – Need a high-end workstation with more than 4 hard drives for additional storage? – Need 256GB of RAM? – Need to modify a workstation Tier to match your needs? – Have a lot of questions that will requires a lot of my time? – Want a custom workstation that’s different from the four Tiers recommended in this article? My rate for advanced services consulting is $299.95. – Unlimited e-mail support with fast replies (usually within 24 hours, often faster). – I’ll be there to assist you until you’re satisfied with your custom workstation and order your parts. Note that if you need more than one custom configurations (for a few or many different workload types or different budgets), please contact me at the e-mail address below so that we can negotiate a reasonable rate based on your needs. – Need assistance or have any questions that aren’t addressed here? If you liked this article, if it helped you save money and time and if you appreciate the website for providing valuable, up-to-date, unbiased information, I kindly ask you to help us by making a donation via PayPal. I suggest donating 1% of your build cost, or part of what you saved by using our recommendations in this article. Of course, feel free to donate as much as you wish or can. Thank you. I do realize that even if I took a year to write this guide, it wouldn’t be perfect and it wouldn’t cover every possible software/scenario. Simply drop a comment below to let me know. I’ll personally recommend to you an equivalent alternative and I will update the build shortly after. Don’t miss out on the Workstations updates! We’ll soon be updating the Mainstream and Entry-Level Workstations. Also, as time goes by, parts go out of stock, new more powerful/efficient parts come out and more reasons cause me to update the builds. To make sure that you don’t miss an update, you can receive our updates for free via RSS or E-mail. If the fact that you’ll be receiving free updates is not enough to convince you, here are 7 Reasons to Get Our Posts Via RSS or E-Mail For Free! Windows 8 fixes all kinds of issues for networking, it’s really not as bad as people think it is… Don’t hide from technology if you consider yourself an IT professional..
Did you even read my arguments as to why I recommend Windows 7 over Windows 8? I’m not saying that Windows 8 is bad, simply that at this point in time, Windows 7 is preferable over Windows 8 for a workstation, due to superior stability/compatibility and multi-tasking that’s a lot easier/faster to do on Windows 7. I am hoping that you can update the budge gaming pc build article. I am trying to build one for a family member and I am bit torn between AMD apu vs Intel build. I’ll be updating the Budget Gaming PCs this month, most likely this week. I was wondering about your thoughts on the E5-2620 2.0 – 2.5 GHz. Are their any issues to be concerned about, other than the slightly lower clock speed (Compared to the E5-2630)? Nope, no issues with using the E5-2620, it’s just a model with lower frequencies. If i buy a Cpu Xeon E5 2690 from ebay and same model 2690 from local shop, can i use the in dual with this motherboard? Thank for your article :)! 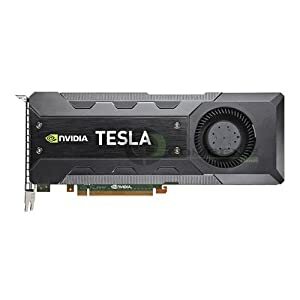 Can I combine 2 cards Quadro K6000 and Tesla K20x? thanks for the post. I built a similar workstation around august 2013. I used Fractal Design Define R4 with Window Black Pearl for 80$ from newegg. kind of liked that MoBo view from that cool window that these cases come with. and definitely think this case is the best for this purpose. SSDs in the back and plenty of space for the RAIDs. 4 USB ports in front and fully sound proof. price was right and it has some cool advanced features when compared to the one you used. for cooling I used 2X corsair H60 liquid cooling. I have to admit I overdid it as I know my Xeons will never get that hot, but wanted the cool look from the window and also bought the H60s in a special deal from newegg for just under $60 each. So quite comparable price with what you used for cooling. but I got a few degrees lower temp when it comes to the CPUs (it is liquid cooling) and mobo/the air inside the case, is a few more degrees cooler too I guess. you could have posted some AIDA64 figures for the build so we could compare. I hope I reduced the noise too by having less fans inside the box. loaded the Mobo with 64GB ECC DDR3 RAM PC12800 memories from samsung M393B1G70BH0-YK0 actually the low voltage version(1.35V which makes them run cooler and consume less). and got them for a very good price. power supply : although it was a present it was exactly what you have mentioned somewhere Antec EarthWatts 650W ver 2.3 but a bit different. would have loved the older version of Earthwatts ver 2.2 with four 12V+ lines and 25A on each, but had to settle for this PSU 80 Bronze GREEN with 2 lines 38A each. the truth is that I havent loaded my box to the extreme and therefore this PSU has been quite stable, while leaving my computer on for days, crunching numbers non stop. and for $70 is still affordable for the quality. with CPUs 95Wmax and GPU cards 57Wmax the power supply has been never in troubles. most of the time troubles come with overclocking. the storage you have used is a bit expensive. I have used for the OS a samsung evo840 250GB, and for the VM-s that I run another one 500GB. they are much cheaper than the PRO version (and I am aware that they also are lower quality) but so far I have been happy bringing up my Windows server 2008 Enterprise R2 and four VM varying from linux boxes to other win servers. after all with 24 virtual cores and 64GB of memory is easy to have all this action in one box. for the massive storage your choice is right WD red label. have 2 RAIDS 2GB and 1GB (was worried for the 3TB version of the red label as the reviews were not that good) and they have been rock solid. Have other single HDDs as that case can host quite a few HDD inside. Graphics were never considered for the purpose of my build. I am doing financial calculations in this box, and all I wanted to do was only to drive 4 monitors that serve my multitasking box, so I settled for a gift from my friend: 2 X Nvidia quadro FX1800, old but very stable card. they consume only 50+W at max, run on my box at a temp around 50C and have never failed me on any of my screens, no matter what I am up to. Evga precision X drives them automatically and monitors their state. for the Mobo in question these cards are a good solution as they take only one slot and dont occupy a lot of space while allowing a good airflow. they have 800MB fast 192bit ram and enough cuda to run a wide range of graphics software. Again I didnt want to go down the path of GPU calculation and wanted to keep simple the video output scheme. I drive 4 19′ Acer monitors with a decent resolution, standing in two tyke monitor stands. the Mobo is a good choice given that it is still a dual CPU ATX one(should have paid less from newegg as they offer 10% off from time to time on these items), but there are few flaws with this gadget. I had to buy a PCIe USB 3.0 as although the Mobo has a built in USB 3.0 there is no socket for the USB 3,0 of the case cable. Let alone the audio, as this is a server class MoBo. so a suggested 7.1 surround audio card from Asus (I think it was not an expensive one ASUS MIO-892 High Definition Audio Card) occupied one of my PCIe slots too, leaving only one slot free between the X16 slots where the video cards are. I listen music through my dolby 6 speakers + Woofer so I think there was no other way to go around. wanted to try a Griffin USB audio converter, but given the number of the speakers that was not an option. Got paranoid with security and got a security platform which plugs in the Mobo ($10 at superbiiz) where my security is saved/generated and also I run ASMB6-iKVM for remote control. Actually this triggered based on the dual network possibilities of the mobo a dual router setup, although they are both based on the same cable internet provider. an apple airport extreme and a buffalo dd-wrt enabled, feed the mobo separately, and I am able to do openvpn through dd-wrt on the buffalo, while have to admit, there is no router like those apple boxes. plus two 5 inch bays above which can be converted in storage slots. and I can connect storage through eSATA in the back. SSDs go in the back and I have seen 3 of them (one hanging on Velcro) in a build recently 🙂 for this Mobo. also added a gadget for fan control speeds since I have 4 x hydraulic bearing 140mm Silent Series R2 fans, and while two are controlled from a switch in the case (thanks Fractal) the other two get controlled through this gadget which also has some led display for activity (HDD, Network, etc) and can be hooked in the mobo as there is a lot of info that can be harvested from the pins in the panel and addtl panel section. Next time I will post some numbers on performance of this box. Hello Mathieu. Thanks for the wonderful post. 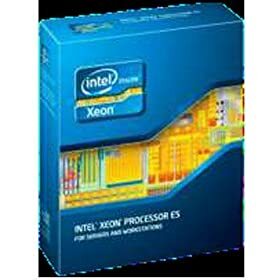 Btw, whe we can’t go for Xeon E5-2630 v2? Is it something that this V2 was not released by the time you wrote this article? Or do we have some other issues with that? I would love a updated workstation PC build Article.